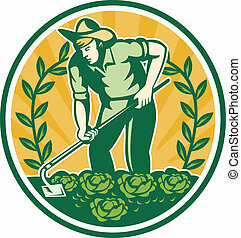 Farmer agricultural worker with rak. 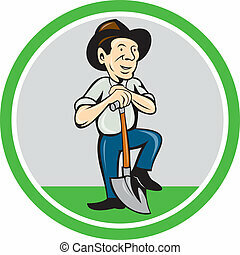 Illustration of a farmer agricultural worker wearing hat with rake and sack of seeds facing front done in retro woodcut style. 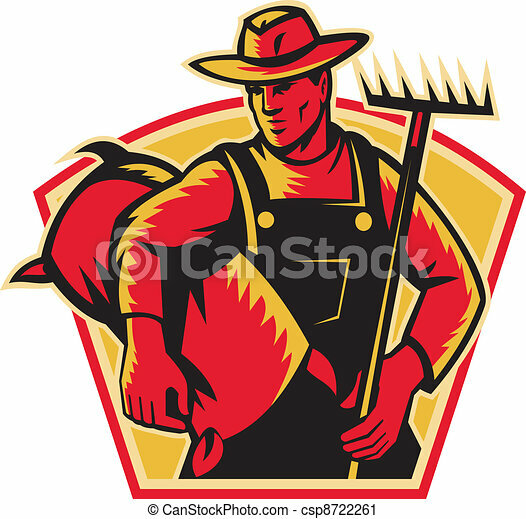 Illustration of a farmer agricultural worker wearing hat with rake and sack of seeds facing front done in retro woodcut style. 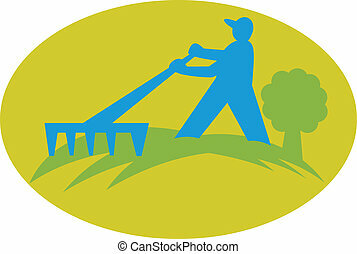 Illustration of a farmer gardener landscaper worker working with rake set inside ellipse. 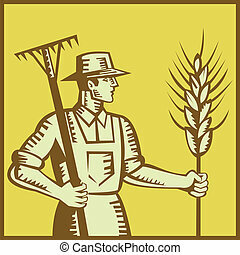 Illustration of a farmer worker holding a rake and wheat set inside square done in retro woodcut style. 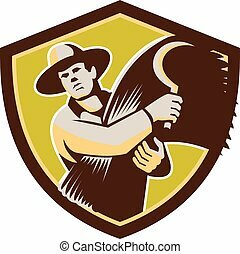 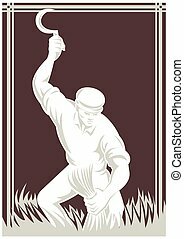 Illustration of a farmer farm worker holding scythe and wheat harvest facing front set inside shield crest on isolated background done in retro style. 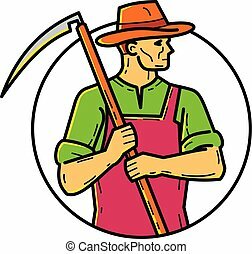 Mono line illustration of an organic farmer, agriculturist or agriculturer, holding scythe, an agricultural hand tool, on shoulder looking to side set inside circle done in monoline style. 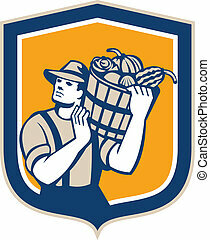 Illustration of wheat farmer carrying bucket basket with crops produce harvest on shoulder looking to the side set inside shield crest shape on isolated background done in retro style. 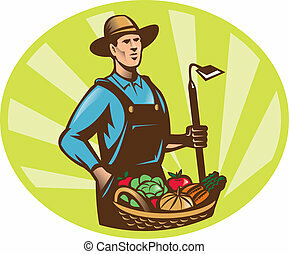 Illustration of a farmer holding a garden hoe wearing hat with basket full of vegetable fruit crop harvest done in retro woodcut style. 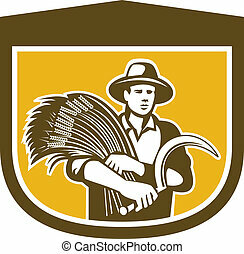 Illustration of wheat farmer with crop produce harvest and holding scythe facing front set inside shield crest shape in background done in retro style. 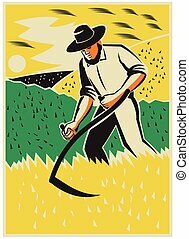 Illustration of a farmer with scythe working the farm field harvesting reaping crop harvest done in retro style. 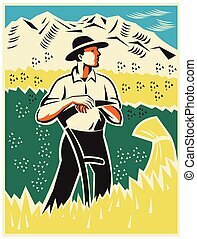 illustration of a farmer with scythe standing in wheat field facing front with mountaions in background done in retro woodcut style. 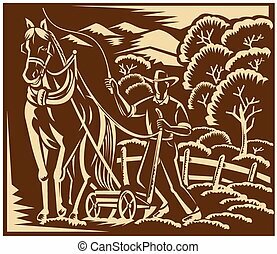 illustration of a farmer harvesting wheat with scythe done in retro woodcut style. 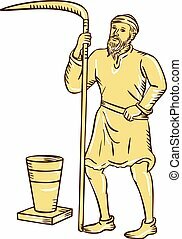 Etching engraving handmade style illustration of a medieval farmer farm worker holding scythe standing facing front with pot bucket pail set on isolated white background. 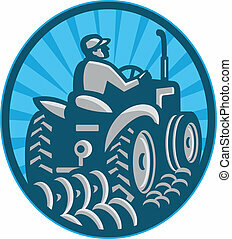 Illustration of a farmer plowing with vintage tractor viewed from the rear set inside oval done in retro style.